I am like the tuner. I’ll make sure the instrument is in tune, but you play. 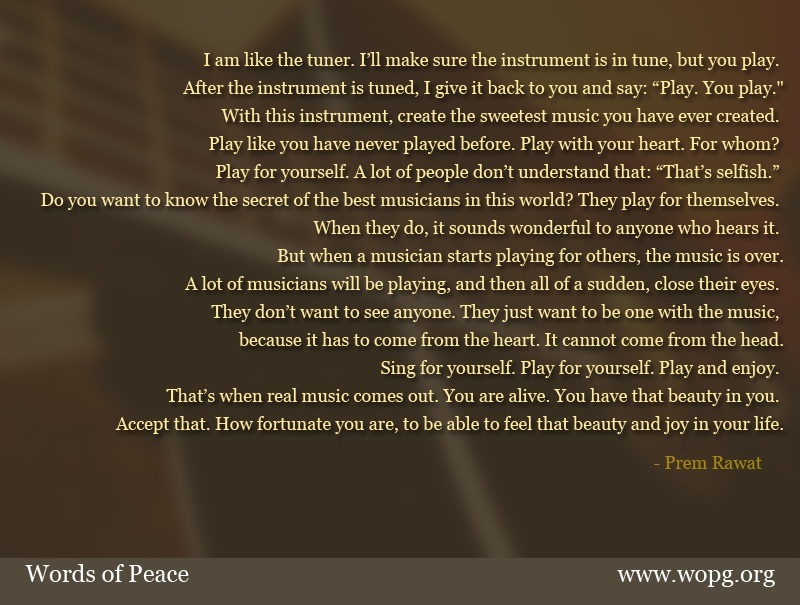 After the instrument is tuned, I give it back to you and say: “Play. You play." With this instrument, create the sweetest music you have ever created. Play like you have never played before. Play with your heart. For whom? Do you want to know the secret of the best musicians in this world? They play for themselves. When they do, it sounds wonderful to anyone who hears it. But when a musician starts playing for others, the music is over. A lot of musicians will be playing, and then all of a sudden, close their eyes. because it has to come from the heart. It cannot come from the head. Sing for yourself. Play for yourself. Play and enjoy. That’s when real music comes out. You are alive. You have that beauty in you. Accept that. How fortunate you are, to be able to feel that beauty and joy in your life.